Skip the Shrub Protectors | Faddegon's Nursery, Inc. I am always looking for ways to save time, money and sore muscles in my gardens. Dragging out heavy shrub protectors every fall was dragging me down. So I started looking for foundation plants that didn’t need protections from heavy snowfalls, freezing rain or crashing snow from overhead roofs. ‘Big Boy’ perennials were my solution. They provided the weight and scale of shrubs but duck below the ground (go dormant) before the snow starts flying. 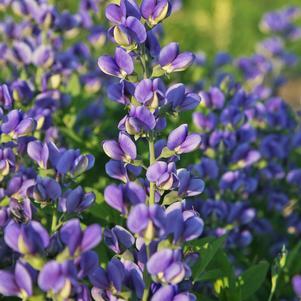 False Blue Indigo (Baptisia). It reaches 3’- 4’ and has attractive leaves with June flowers that are either shades of blue (‘Decadence’ pictured), smokey-purple, yellow, white or bi-color depending on the cultivar. Ornamental grasses are another choice. Of course, a benefit of most grasses is that they provide winter beauty to landscapes but if they do get pounded by snow, it won’t kill them. Meadow Rue Glaucum (4’-5’, sulfur-yellow blooms in late June-July). larger hostas. And by large I am referring to those reaching three feet or more (with an equal or greater width) and sporting massive leaves. ‘Frances Williams’, ‘Sum and Substance’, ‘Krossa Regal’, sieboldiana ‘Elegans’, ‘Blue Angel’, and ‘Big Daddy’ all fit this bill. Astilboides looks like it is from another planet. It has monstrous leaves that can measure over 2’ across, spreads to 3’-5’, and gets about 3’ tall. White, astilbe-like flowers decorate it in July. It prefers partial shade with evenly moist soil. Rodger’s Flower (Rodgersia) has highly textured, tropical looking leaves with pink or white plumes in July. There are also some Astilbes with towering flowers. ‘Purple Candles’ (purple-rose flowers); ‘Cattleya’ (rosy-pink plumes), and taquetii ‘Superba’ (lilac-pink plumes) stretch to almost 4’ and bloom in mid-summer. As with all Astilbes, they do better in spots that get some sun (dappled is fine), but not deep shade. Finally, Variegated Mountain Fleece (Fallopia ‘Variegata’) has arching pink stems with sharp looking white and green mottled leaves. It can get 3-4′ tall with wispy white flower is in summer. So give some of these plants a whirl and stop wrestling with those heavy shrub protectors!